One of my college roommates loved the ole snooze button, and it drove me nuts! Personally I’ve never been a big fan of it. For whatever reason, to me, it just seems harder to fall back asleep and get up nine minutes later, than it is to just get up the first time. I recently listened to an inspiring interview with Mel Robbins, national best selling author of The 5 Second Rule. To give you the abbreviated ‘according to me’ version of the interview, here’s what Mel had to say. 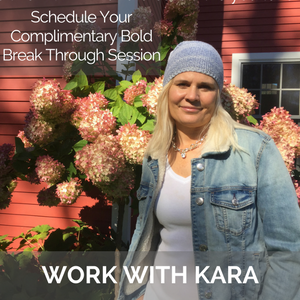 She went through a totally rough period in her life…she lost her job, her husband’s business went belly up, bankruptcy and liens were staring them in the face, and there was incredible tension in her marriage. She couldn’t bring herself to get up when the alarm went off in the morning, and instead kept hitting the snooze button. After a couple months of practicing hitting the snooze button, she stumbled upon a rocket being launched on tv. It was out of that moment, she discovered a rather silly five second rule…But it worked for her. And all she did was countdown from five to one. And since it worked to get her out of bed the next morning, she started using it in conversations where she needed courage, when she was upset with her husband and kids, and to interrupt worry, self-doubt and even her panic attacks. Without getting all scientific, what happens is that we normally make decisions by referring to our habitual, practiced way of thinking. Have you practiced taking the path of least resistance? Deflecting compliments? Worrying? Shrinking? Or yelling at your kids? Robbins says that we have these practiced ways of thinking and behaving. We basically put ourselves on autopilot and think, act, and do the same old things. If we wait for the feeling to come to make changes, it may never happen. So, that’s why she’s implemented this “5 second rule” in her own life. She counts down backwards – 5…4…3…2…1, and in essence, it shocks her brain out of that habitual, autopilot mode, and moves her brain into decision maker mode. 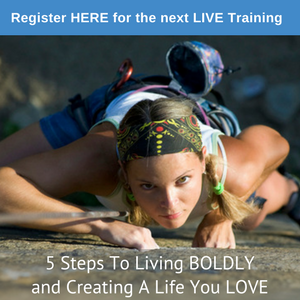 It almost seems to simple to actually work, but it has revolutionized her life and the lives of thousands around her. And as simple as it seems, there’s actually a lot of science behind why the rule works. Although I’m fairly quick to rise, I know I’ve hit the snooze button in other areas of my life and I want to invite you to enter into a little experiment with me this week. The next time you find yourself going down that old familiar path, countdown backwards from five and take action or choose a more empowering thought. Don’t want to get out of bed….5…4…3…2…1 And you’re up! Don’t want to make those sales calls…5…4…3…2…1 And you’re dialing! Just for this week, together let’s try the 5 second rule, and see what happens. Give it a try and let me know how it works for you. Also, if you’re interested in any of the science and details, check out Mel Robbins on Youtube here. 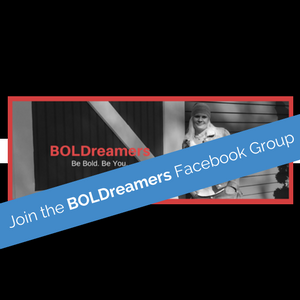 PS – If you haven’t joined our Facebook Group, BOLDreamers just click here, and I’ll give you access right away!